I try to squeeze in a 15 minutes cardio exercise a day into my already busy life. Being a full time mom of 3 boys and working as a pharmacy Tech there's not enough time to do an hour exercise. Most of the time I do planking and now I can add a different way to do planks using an exercise ball. Thanks to Live Infinitely for offering me to review their Forever Flex Exercise Ball. This is a great addition to my home work-out equipment collections. The product came with hand air pump, air valve remover tool and instruction manual. I could have gotten a 55 cm ball but I choose 65 cm because my oldest son is already 5' 7" tall and so we all can use it. The ball size varies based on height and here is the sizing chart. I am amazed on the quality of the product. The ball is made from latex free Professional grade PVC material so thick that I won't worry about bursting. My husband's old exercise ball was not as thick as this one. It supports 2200 lbs static load and can hold 600 lbs. Perfect for my husband to use since he is over 200 lbs. My two younger kids sat on my husband's lap and the ball didn't burst. I like the non-slip ridges, it helps me keep my balance when I do my planks. My kids love it and has been playing with this ball since day one. It helps them to stay active especially this winter season. I was able to do crunches, planks and back stretch. The ball is soft and sitting on it feels relaxing. I've noticed that when I sit on it my lower back pain goes away. Sitting on the couch for long hours gives me lower back pain but this ball doesn't. With this ball I can do exercises while watching my favorite movie. 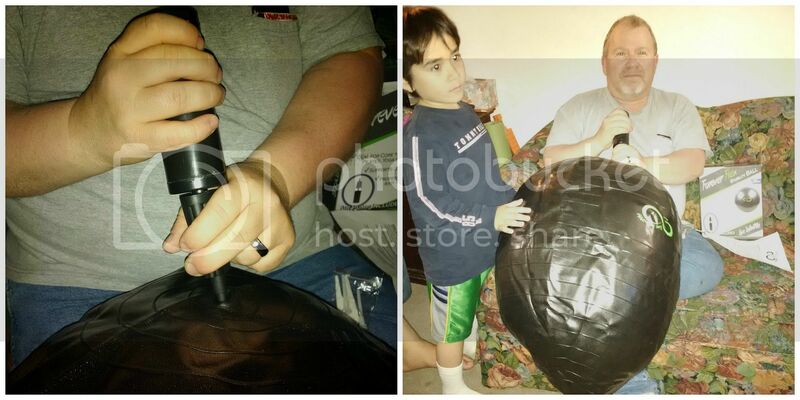 The hand air pump works really good, my husband didn't have a hard time inflating it. I had a great time and a lot of fun with this product with my family. I recommend it for you to try, so visit their amazon account here. I could use one of these as it looks like something I'd be able to maneuver despite my back injuries. I'll look into it and see if it's possible for me to use. My husband has a ball like this that he sits on at work. He said it really helps his back. I haven't used an exercise ball in a long time. I need to get back to it. This looks like a really good one. This sounds like a great tool for making exercise efficient and fun. I always try to stay active to burn calories. This looks like a fun way to stay fit. My son had one at school last year for his chair at his desk. I think I might love using one at my desk when I'm working, too. Looks like a fun and convenient way to stay fit. I'll have to look into getting one of those to add to my exercise regimen. These exercise balls can really come in handy! They work great for hip pain when you are pregnant too! I really like using those for sit-ups. They help support my back but they let me really work the abs. I have one of these. It's nice to use at your desk when working out as well. Haven't planked with it before. I love working out with an exercise ball. It really feels nice to stretch my back out on it! Love using a exercise ball! I practically lived on mine when I was pregnant with my last little one. It was the only thing that helped relieve the pressure.